The Inventory Transaction Audit Trail Report provides a complete history of transactions affecting on-hand levels of an item or range of items. The report is generated two different ways depending on whether on-line or batch transaction processing is selected in I/M Setup. If on-line processing is being used, the report prints all add, change, or delete actions taken against an item by location. It allows the user to define which types of transactions (issue, receipt, and transfer) will appear on the report. The user may also choose whether to print the report and purge the Transaction Audit File or to only do one or the other. If batch processing is being used, the report will always be printed, but the user may still decide whether or not the Transaction Audit File will be purged. The user may also set two additional limits on the batch report. Transactions for the report can originate in the I/M, COP, P/O, BOMP, SFC, LP, and JC packages. The user may choose to include transactions from any one or all of the packages. The report may also be run for a specific location or for all locations on file. 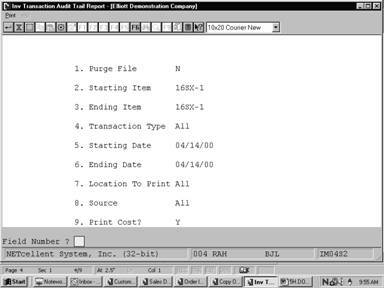 The batch report prints the transactions by item number and location, and lists the type of transaction, date, quantity involved, new quantity on-hand, and other information for each. If batch processing is being used, beginning balance records can be created in the audit file using the Set Trx Audit File Beg. Balances application. The beginning balance record captures each item's quantity on hand at each stocked location as of a specified date. New items added through Item File Maintenance and new stocking locations for items added through Location Control File Maintenance after beginning balances have been set will create new records using the system date. Note: Regardless of which type of processing is being used, this application may only be accessed if the Audit Trail On Inv. Transactions ? flag #19 in I/M Setup is set to Y. Enter Y to print the report or N to decline. Fields 1 and 2 may not both be set to N.
Enter Y to purge the transactions or N to decline. Enter the starting item for the range you want to print. Enter the ending item for the range you want to print. Defaults to the starting item. Enter the starting date range for the transactions you want to print. Enter the ending date of the range of transactions you want to print. Org‑Date Org‑Time Fr To Trx‑Cost Old‑Avg‑Cost New‑Avg‑Cost Comments Cmp? Enter Y to purge the transactions or N to decline. Defaults to N.
Entry is required unless the Set Transaction Audit File Beg. Balances application has been run. In that case the date defaults to the date defined in that application. Enter the location for which the report will be printed. 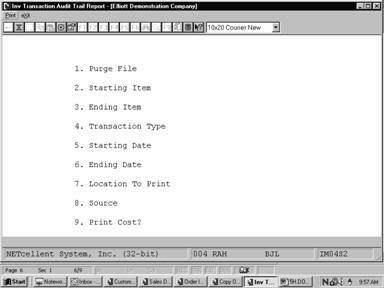 Enter the source package for the transactions to print on the report. If a source is entered, only transactions originating in that package will appear on the report. Press RETURN to default to ALL packages.